Warranty applies to the purchased product. Double holder design, your tablet and phone can be held at the same time. Rod length is adjustable within the range 17.7-27.2", fix it at any position you like not just in car. 360 degree rotation design allows customized and ideal viewing angle for both holders. Share your easy and comfortable trip. 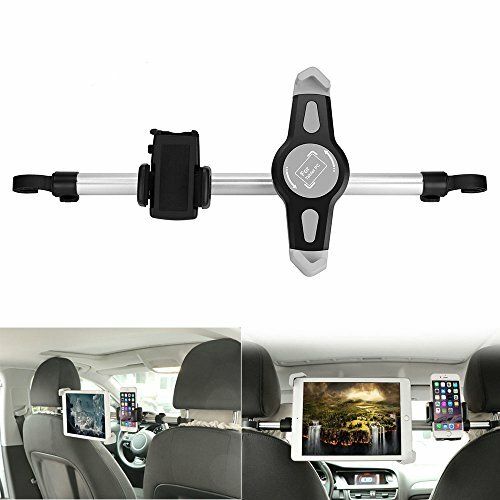 Effortless installation and easily secure to headrest without use of tools. It is made of high quality ABS material for the holder and Aluminium and is durable enough for long-time using. Compatible with: iPad mini 1 2 3 4, iPad 2 3 4, iPad Air, iPad Air 2, iPad Pro 9.7 10.5, Samsung Galaxy Tab, Tab S, Galaxy Note 10.1 and 8.4, Google Nexus and other tablet between 7'' and 15'', phone width between 1.6'' and 3.5''. If you have any questions about this product by Konesky, contact us by completing and submitting the form below. If you are looking for a specif part number, please include it with your message.